There are times in life when only chocolate will do. Last week’s stresses included a son training for a scary bike event, a book to finish and a bill for a car exhaust – so I definitely needed a slab of Dorset’s best chocolate. I hotfooted it along to Chococo’s Swanage emporium and snapped up a selection of their gorgeous handmade chocs, which were devoured (by three of us, I hasten to add) at high speed. My long-time favourite is Chococo’s Brilliant Black Cow chocolate, a work of choco-art made from a glug of Dorset’s Black Cow vodka, fresh lime zest and black peppercorns. You can buy a single chocolate or a whole box of them and trust me, they taste as good as they look. Not surprisingly, this Dorset-based company has won a raft of awards over the years. By the way, if vodka isn’t your thing, how about trying a Totally Twisted Nose chocolate (made with Twisted Nose gin and fresh watercress) or a Spirit of Saigon chocolate (made with Marou chocolate from Vietnam, blended with lemongrass and kaffir lime coconut milk). Chococo is going from strength to strength, and I’m not in the least surprised. Launched by husband and wife team Andy and Claire Burnet, the company has been making fresh handmade chocolates on Dorset’s Jurassic Coast for the last 14 years. The team uses locally sourced seasonal ingredients – and no additives or preservatives – and has won a string of awards. Andy and Clare are a dynamic duo. 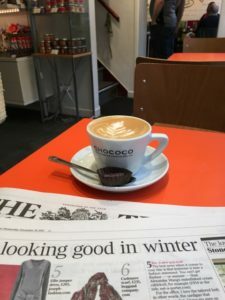 As well as the original Chococo shop and café in Swanage (they make the best flat white in town and you get a free chocolate on the side), they now have two more shops – in Winchester and Exeter. They have a brilliant mail-order service (friends and family can attest to that), their chocolates are stocked at shops all over the country, including Lakeland, John Lewis, Liberty and Harvey Nichols, and they also offer a corporate and wedding gift service. They’ve even written the Chococo Chocolate Cookbook , which was published in the US and Denmark as well as the UK.